If you compare today’s photos with those of previous days, you’ll see that the archaeologists are slowly and methodically moving downward nearly a foot each day. They’ve really hit a stride now, and the view of the old fortifications will continue to improve throughout the course of the dig. With that in mind, I’m posting below the latest photo of the profile of the south side of the apex of the redan. 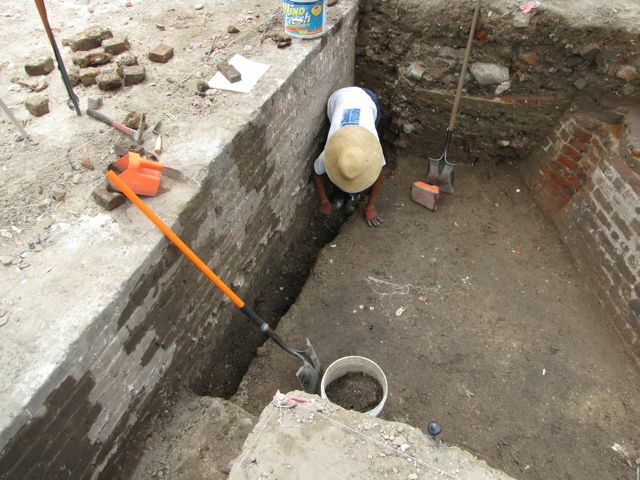 In the center below is a photo of Lisa Randle working in the “builder’s trench” of Vanderhorst’s North Row—that is, the trench excavated ca. 1805 to lay the brick foundation of that building. 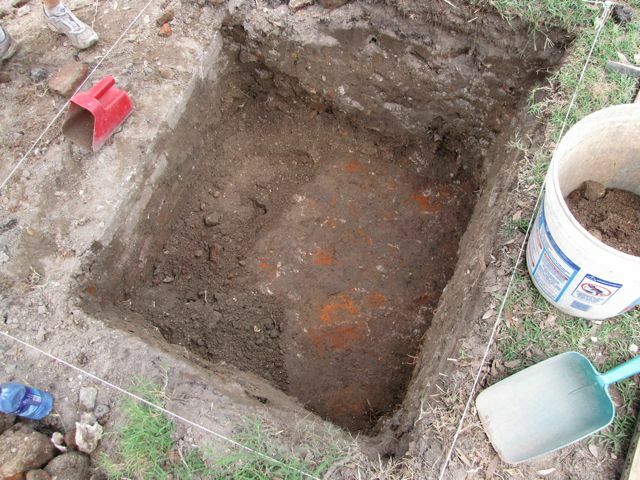 Since that trench represents a different time period from the soil just a few inches to the north, every effort is being made to separate the artifacts from each area. Below right is a photo of a new unit opened today in an effort to follow the south wall of the redan as it continues to the southwest toward East Bay Street. 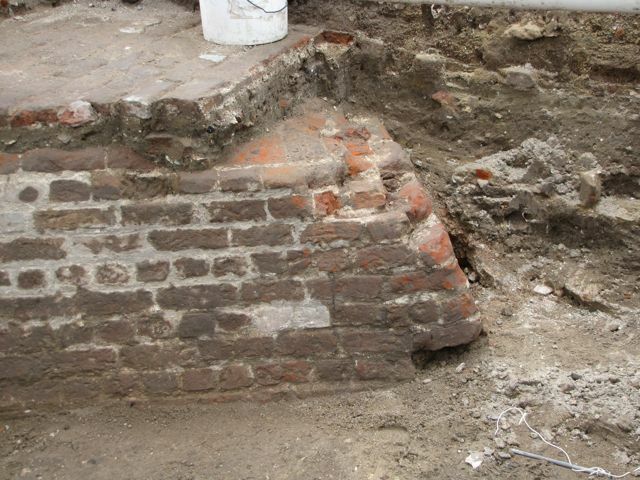 As you can see in the center of the image, it appears that the red bricks of the redan are beginning to peek through the surface—minus the brick floor of the Lower Market that was seen in the units to the east. 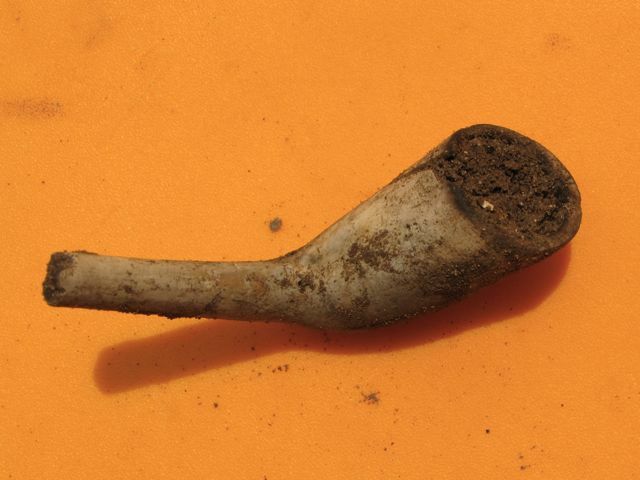 Eighteenth-century artifacts are spilling out of every shovelful of dirt removed from these units. Today I noticed a wheelbarrow full of dirt, ready for sifting, and was impressed by the range of materials just sitting on the surface. 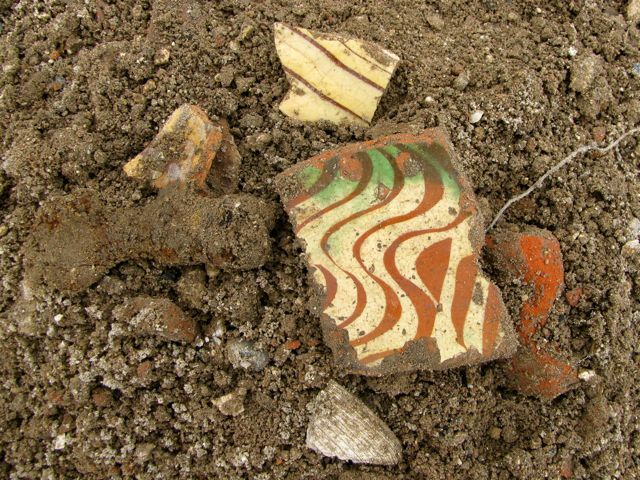 In the first photo below, notice the slip glazed redware in the center and top, surrounded by fragments of red brick, shell, and even a corroded iron fragment (on the left). 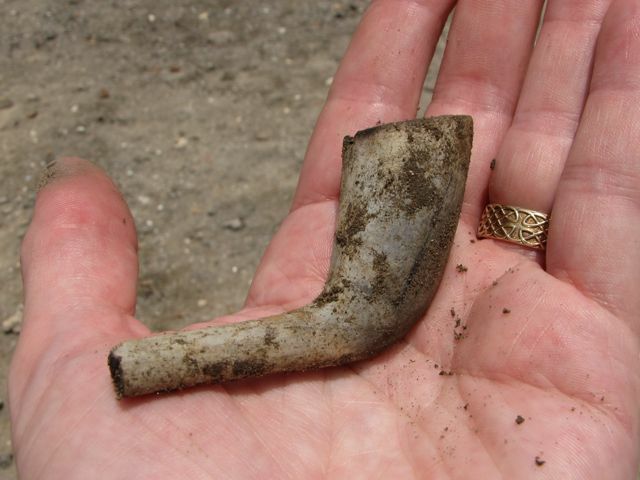 The last two photos depict a rare find—an intact clay pipe bowl. This one is more complete than that found last week, but it’s probably also of a different vintage. I did not find a maker’s mark on it, unfortunately. It was found in the builder’s trench next to the ca. 1805 wall of Vanderhorst’s North Row, so it was probably being used by a bricklayer employed in the construction of that early-nineteenth-century structure. so much accomplished in so little time! Very exciting! What an experience!